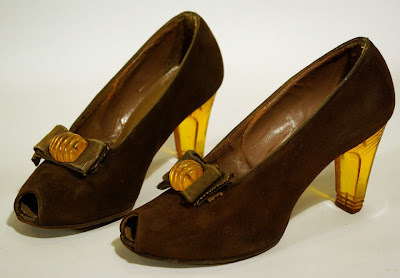 As many of you know, I am unfortunately allergic to leather (actually the chemicals used to tan leather) BUT I am dying to try out some vintage shoes (late 30's/early 40's) as the chromium tanning process didn't begin until the late 30's and wasn't widespread until later. I am holding out hope that maybe, just maybe, I can find me a pair of vintage lovelies that won't cause an allergic reaction! The other problem with trying to find vintage shoes is the sizes! It must be a gold mine if you are a size 5 or 6 but much more difficult if you wear an 8, 9 or 10 size shoe. Oh how I wish I could fit into these size 5 shoes! Sadly, a size 7--I think it would be too tight for comfort. Which ones are your favorite? 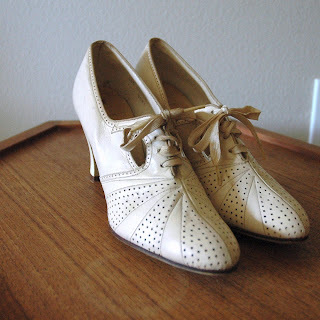 Do you own any vintage shoes? it has with clothing. Anyway, the reason I'm commenting is: in the aerospace industry there is a big push to stop using processes which need chromium. I wonder if the same might filter through to other industries. There may be hope for you yet, even if it takes a few years. In the meantime, I hope you find some lovely shoes to go with your handmade wardrobe. Such gorgeous shoes! I totally feel your pain, I have owned very few pairs of vintage shoes over the years because of my size. I don't even look anymore! I have been thinking of getting some Aris Allen reproduction shoes though -- this lovely 30s style is vegan and has a street sole -- so you could wear it too! Also, I'm way behind but I loved those photos of your mom! That's such a shame about your allergies! Those shoes are all so beautiful. I'm quite lucky being an English four and a half, so I find it quite easy to get vintage shoes in my size. These are all so pretty, I love the flapper shoes. That's so awesome that you found the shoes from the book! Sadly, no, I don't own any vintage shoes for the exact reason you mention. My size 8.5 feet simply don't fit. And on the rare occasion they do fit the length of my feet, they don't fit the width. 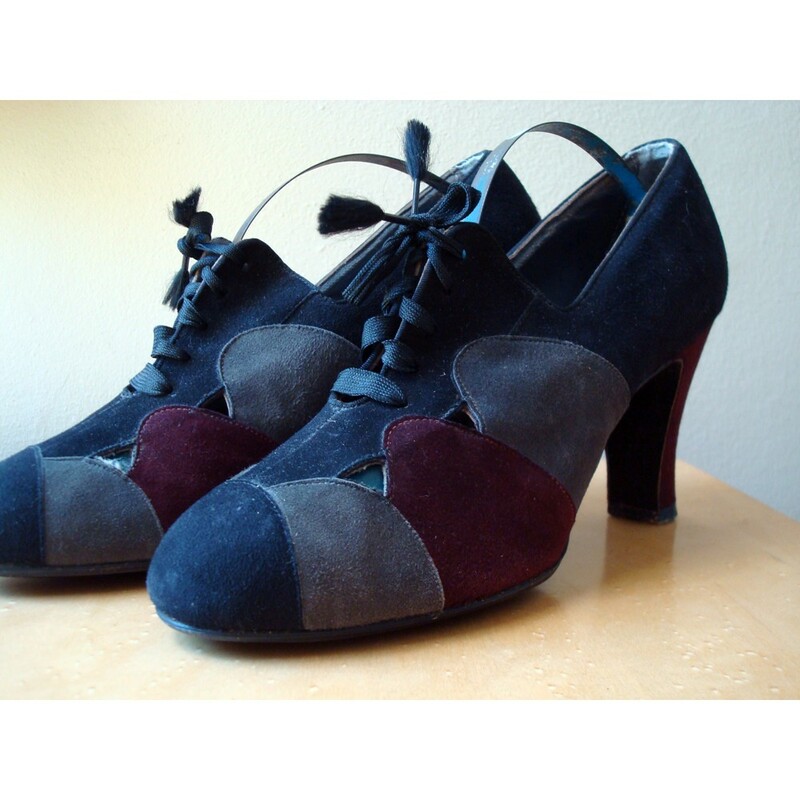 :( I've purchased great shoes from Arris Allen- dance shoe that are as great for dancing in as they are for a vintage look. Of course there is Remix too, but they are equally expensive. One great modern shoe company is Seychelles but if you have a leather allergy then I don't know if any of these will work for you. I'm sure you've tried but nylons don't help? Ooh, shoes, my favorite subject! I am an American size 8, so I rarely find vintage shoes in my size. Sigh. I have a pair of Aris Allen red velvet "practice" shoes, which are a repro of a 1930s heeled oxford. I love them! They're non-leather, and are available in black and in beige. A lot of dance shoes are non-leather and retro-ish; definitely worth a look! Another thing to think about with shoes: sometimes the outer is leather but they're lined with synthetic. You might want to see if that works for you? As for my favorites here, I included the tan and brown shoes from ReinVintage in a post on my blog a while ago! To me, they are perfect. Now if only they were in my size. I also love the flapper pumps and the ivory wedding shoes. They're just beautiful! Oh, the shoes!! *faints* I adore them all, but the cool amber heels on the first pair are sensational! 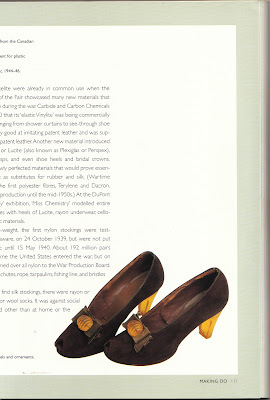 Unfortunately, I don't own any vintage shoes due to pronated feet. I have to start out with new ones. I have tiny feet (size 5) so vintage shoes are my saviour. Here most shoes are only made in size 6 and above which is fine for boots because I can wear thick socks but not so much for heels. I have a few pairs of vintage heels and my favourite shoes are a pair of 70s maryjane wedges which I got off etsy. 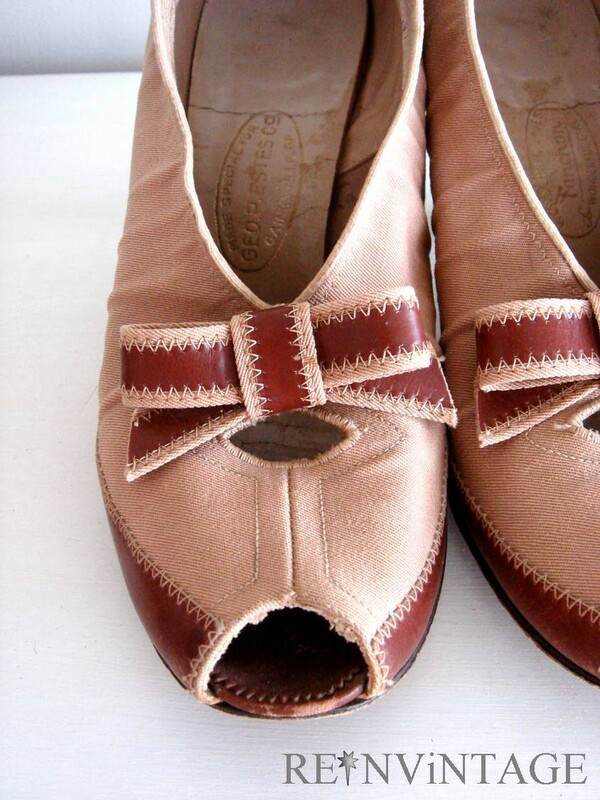 I hope you manage to find some gorgeous vintage shoes in your size that you're not allergic to. Wow, those shoes are amazing! Particularly the first and last pair. 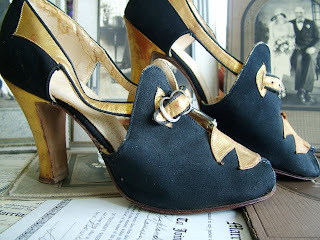 I don't own any vintage shoes - I tend to go for sensible and comfortable, so not old and not heels! I don't own any - I'm a size 9 so suffer the same situation as you Debi! I do love the ivory shoes with the red bows though - they are gorgeous!! I have a small foot - 5.5 US - and it's getting to the point where some shoe stores do not carry below a 6 or even a 6.6. So, yes, I do wear vintage shoes, partly out of necessity! Gorgeous shoes, especially the brown ones with the clear heels! I'm a size 5, but I find vintage shoes are all so terribly narrow that I can't fit my wide feet into them. What a pain having a leather allergy. all these shoes are so gorgeous... oh if i could only wear heels! 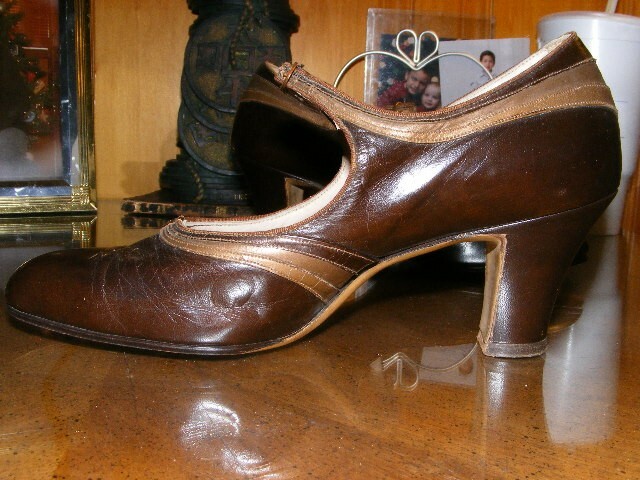 Love the vintage shoes and I wear a size 5! I have the hardest time finding new shoes that I can wear. They seem to all start at size 6 these days. I guess I just need to start buying all vintage shoes! 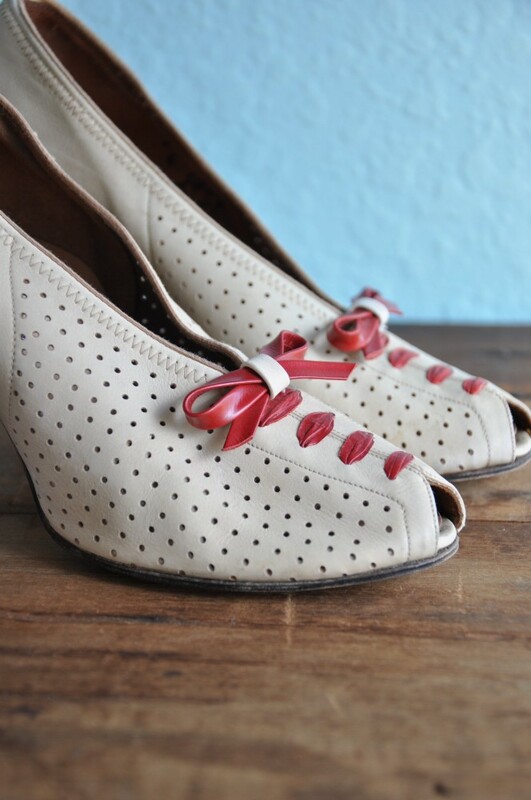 I just wish they weren't all so expensive, although I did find a nice pair of 1940s suede pumps on Etsy for $20. They're a 5.5, but I bet they'd fit. 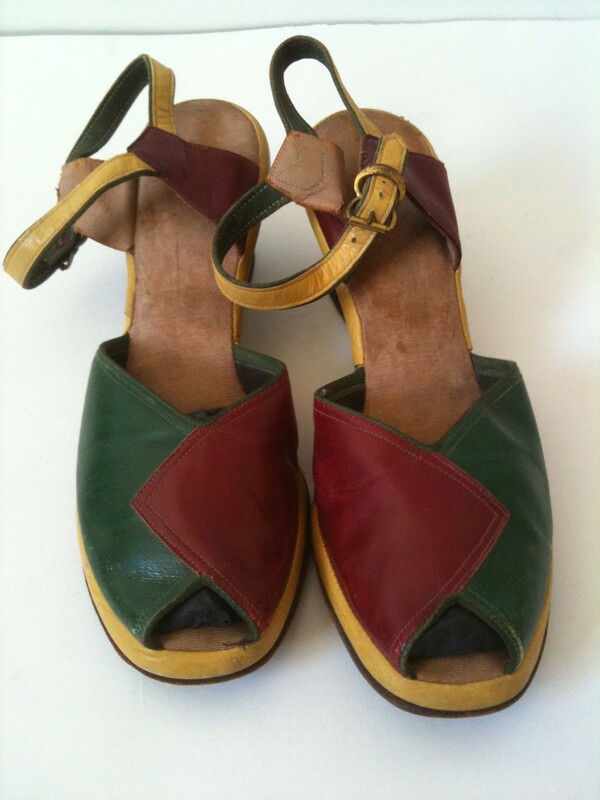 I crave the colorful 1940s wedges. 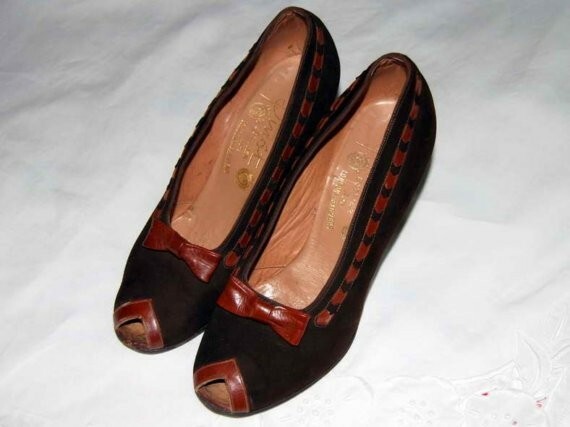 I do own a ton of vintage shoes, mostly Herbert Levines from the 1950s. Wore a pair for my wedding, in fact. Used to own the keenest vintage baby blue cowboy boots but when my car was stolen, so were they! The tears flowed, I can tell you. I know, these don't really work for you because of the dyed leather, but maybe someone will find these helpful. These shoes are pretty pricey but they last a LONG time, even if you dance in them every night! I love this post! Thanks for all the shoe related eye candy! I agree that the 30's had the best shoes!